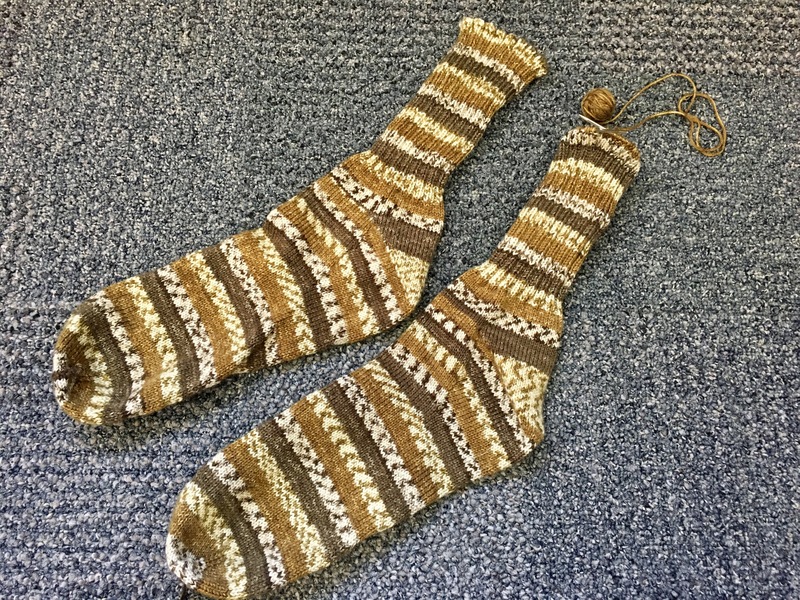 Awhile back my dearest friend from college sent me a sweet gift from the Pacific North West… lovely skeins of some Knitted Wit Victory Sock in the fiesta color way. I couldn’t shake this idea of making the two of us a pair of matching mitts. It’s been one of those project ideas I just couldn’t shake. I want to do something nice for her and maybe send her a little love in the form of knitted stitches. I decided to rectify that. I had my dad get a trace of her foot on his last visit. And I pulled some Knit Picks Felici from my stash. I lost the ball band but I believe this is the splash colorway. I know my gauge and tension in this yarn so I could start straight away. This is a 68 stitch sock on size 0US needles. 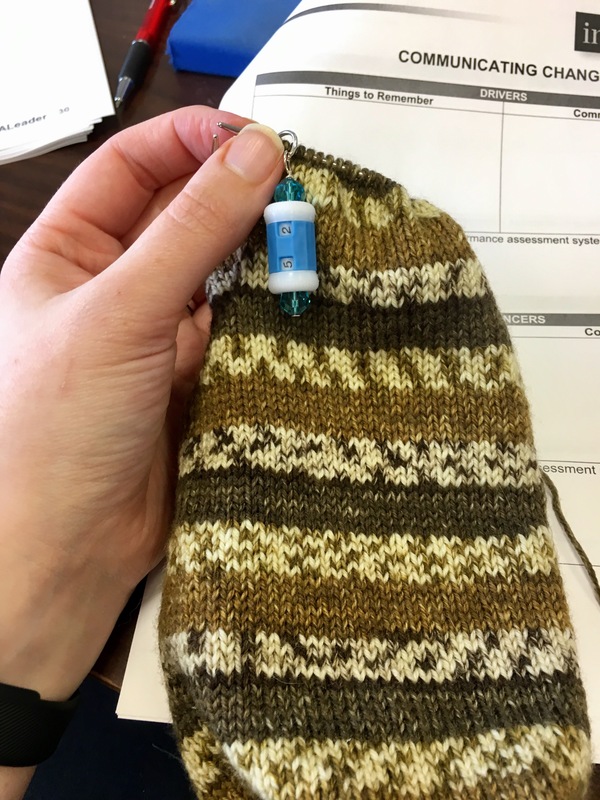 I’m going to make a toe up sock with afterthought heel. I don’t have her foot outline yet so I may have to knit a tube and do a true afterthought heel without waste yarn if I get that far before I reach the heel section. Wish me luck! Happy Knitting!! My Dad’s Camo Socks have surged forward. I made a concerted effort to focus on them since finishing the first sock last Friday. I felt a bit under the weather over the weekend so I got some extra knitting time. I have just a wee bit of yarn left! 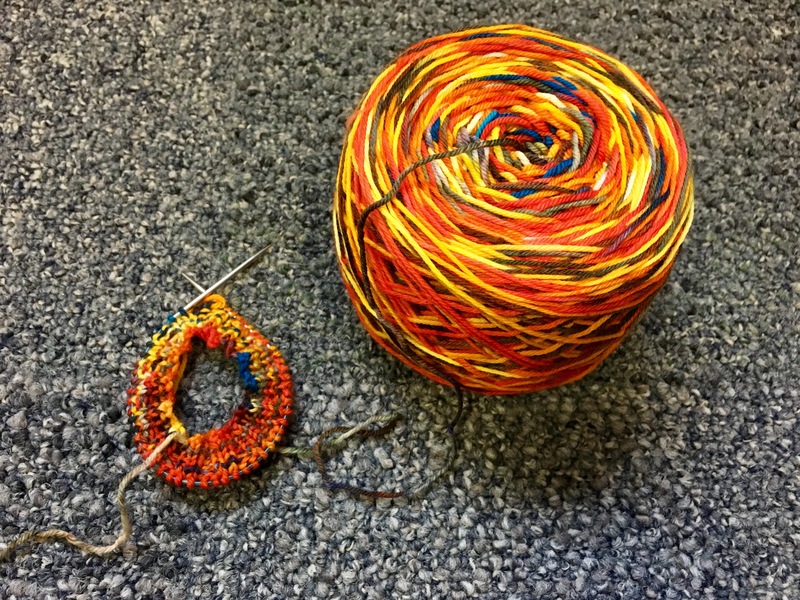 This yarn is a sport weight and goes crazy fast (when I actually knit on it). I have two stripes left and the bind off. Fingers crossed I can make it! HO Friday: One Camo Sock! 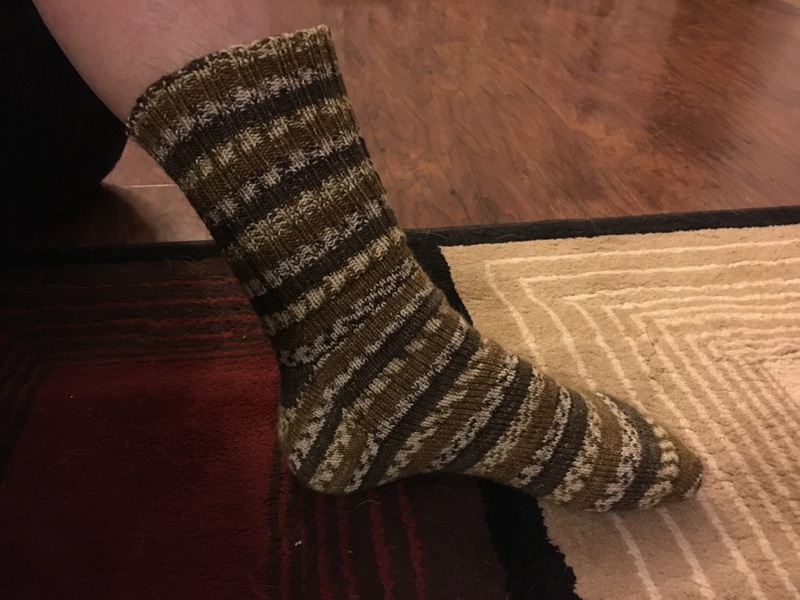 I managed to finish the first Camo sock for my dad! I made my husband stand in as the foot model. It really helps my gift knitting that my hubby and father both have size 13 US feet. Wait, did I really just type that?? This thing is huuuuge! This sock is a 72 stitch toe up vanilla sock with gusset heel. That’s roughly 11 inches of foot alone. 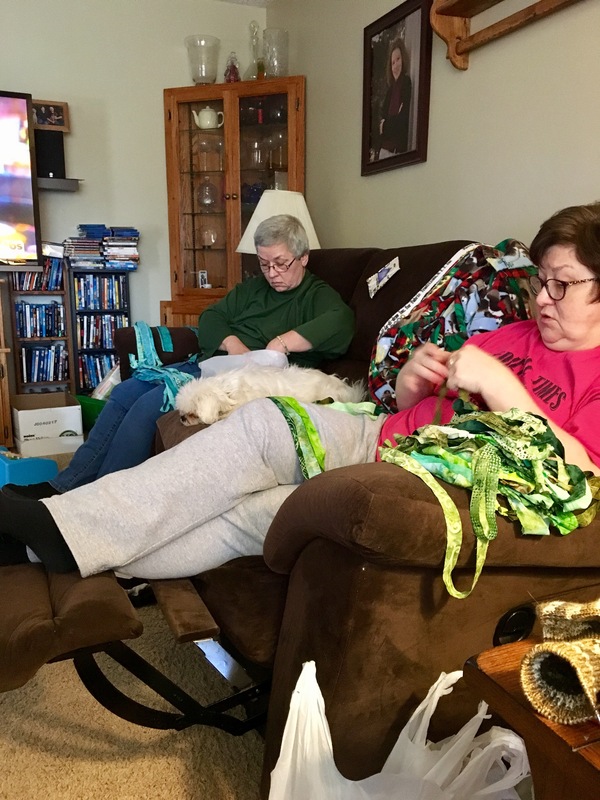 It’s a good thing they are both knitworthy! 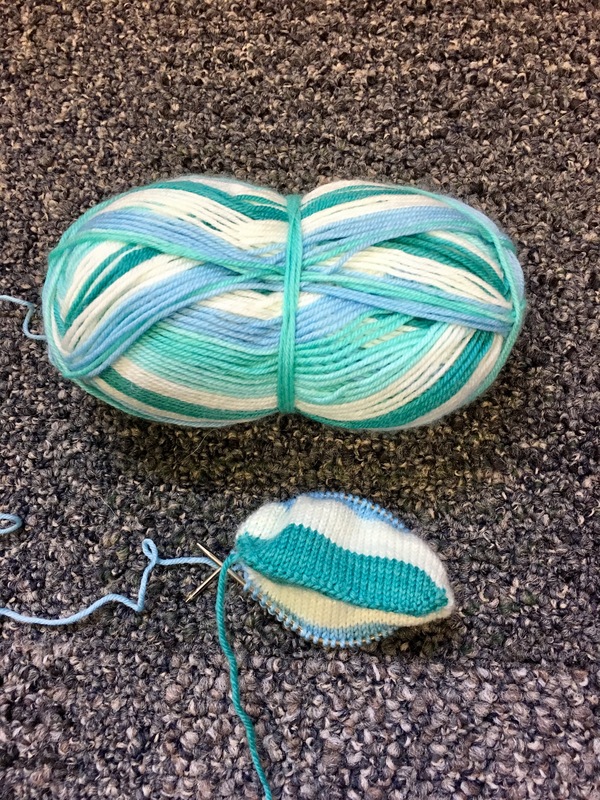 Now I guess I better start the second sock…. My sock yarn memory blanket has seen some additional growth! 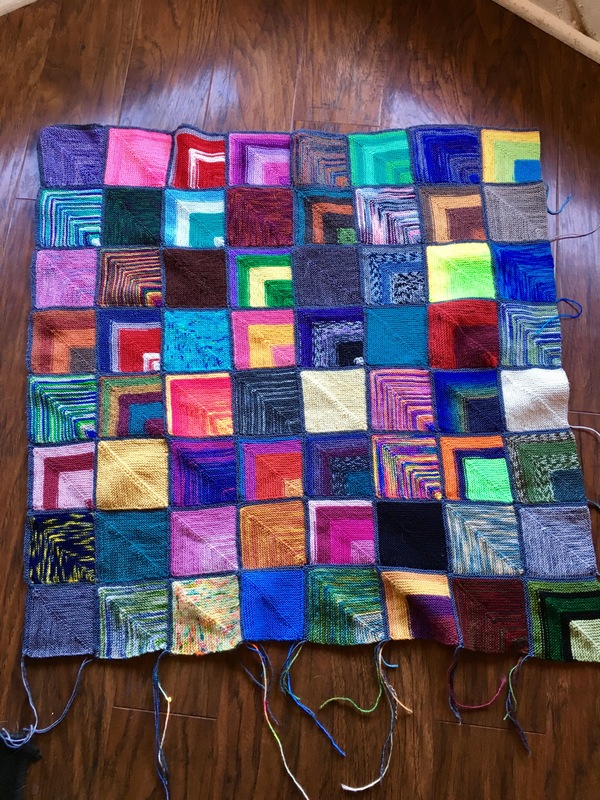 I started adding down the right hand side with four new squares. Then I had I skipped around and added one to the bottom. I get a little fussy about trying to mix up the colors and patterns. It’s just a part of the crazy that rolls around in my brain. I don’t like matching colors next to each other. 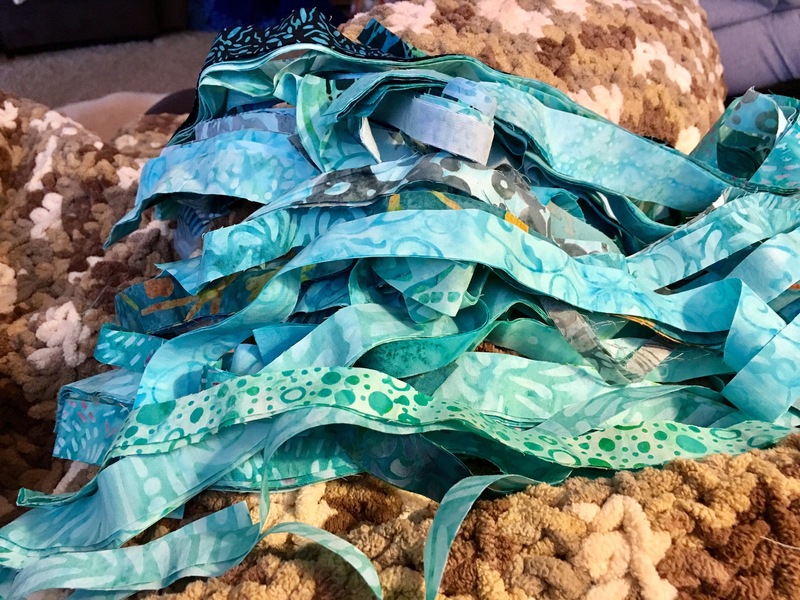 And I have enough scraps that I don’t like solid next to solid or stripes next to stripes (if I can help it). 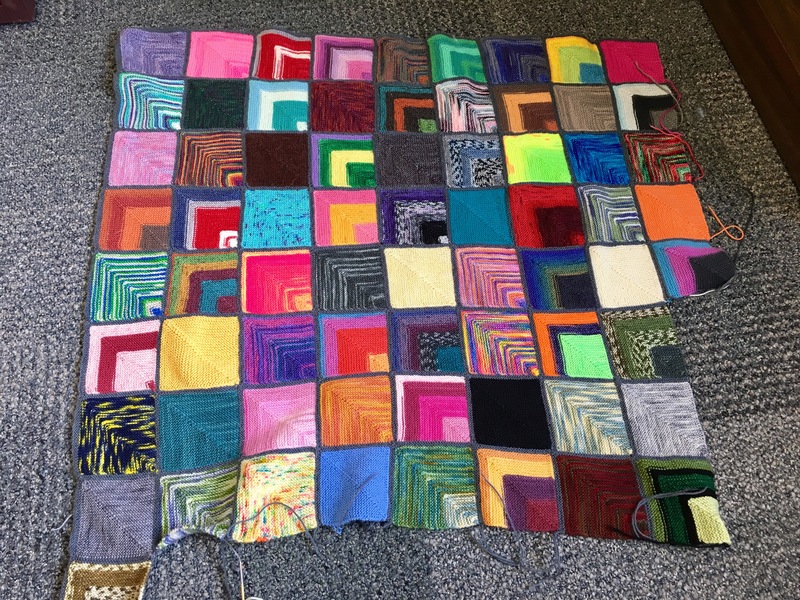 This project is just so satisfying and is perfect to pick up and put down. 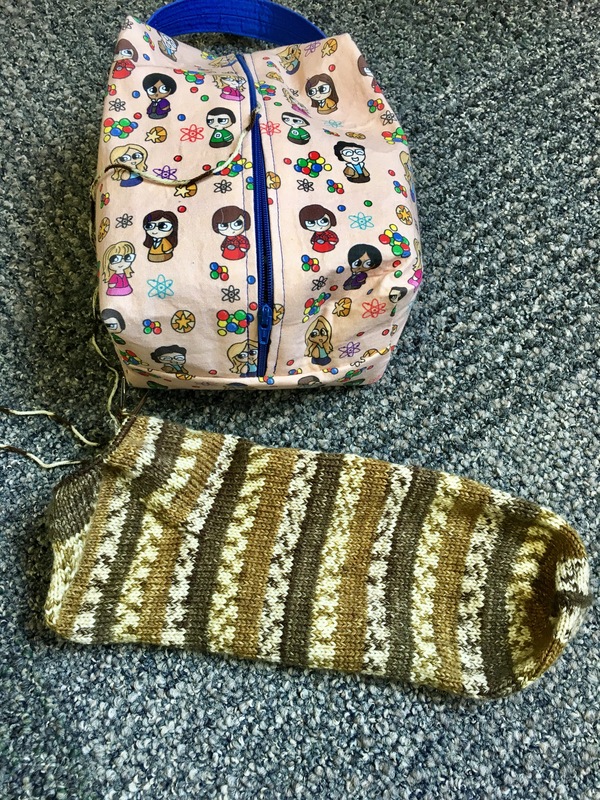 It’s kind of detouring my progress on other projects….oops! The Camo Socks are moving along nicely! The heel is turned and I’ve started the ribbed leg. I took one small detour to knit some of this yarn into my scrap blanket before I ran out. I definitely wanted this yarn in my memory! Now I’m just in the tedious portion of knitting and weighing my skein so I know when I get close to halfway and to cast off. I want to make sure I have enough for sock number two! My mother is a bit of a self confessed hoarder. She hates wasting anything. 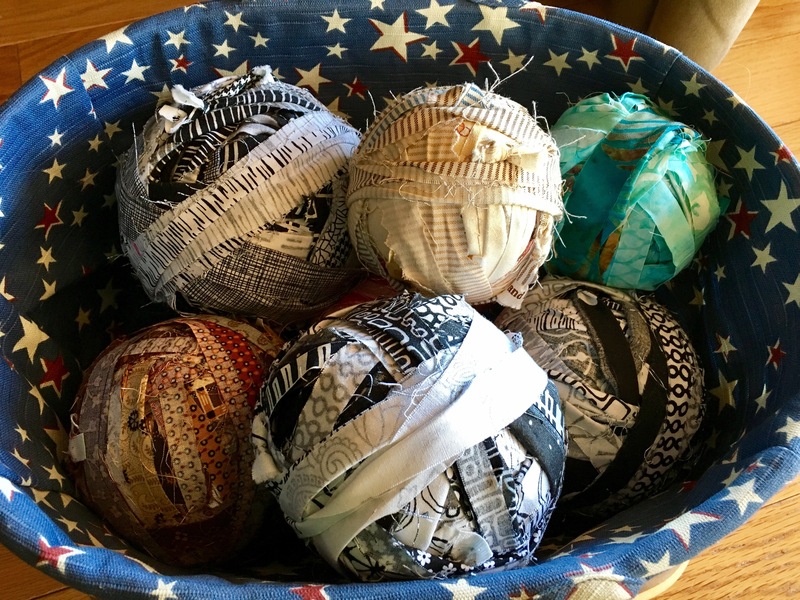 Of late she has been bringing home the fat quarter and jelly roll cast off scarps from her job at a quilt store. On a recent trip home she convinced her sister and I to help. We are tying these fabric strips with overhead knots to make rag yarn for Crochet Rag Rugs. 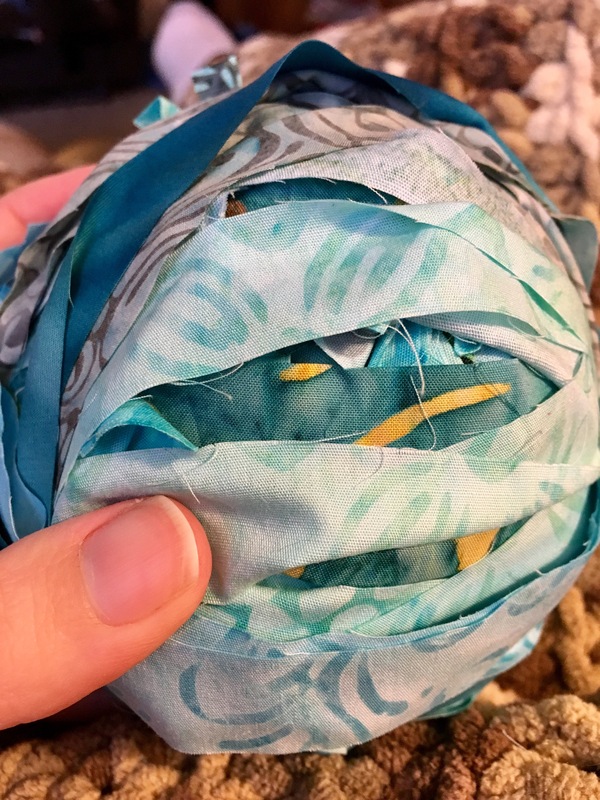 Then rolling the “yarn” into balls. I just couldn’t help but think….god I wouldn’t want to knit with this! But she has a couple of rugs done and a nice basket of yarn finished. I guess we are just a crafty family! Happy Crafting!! 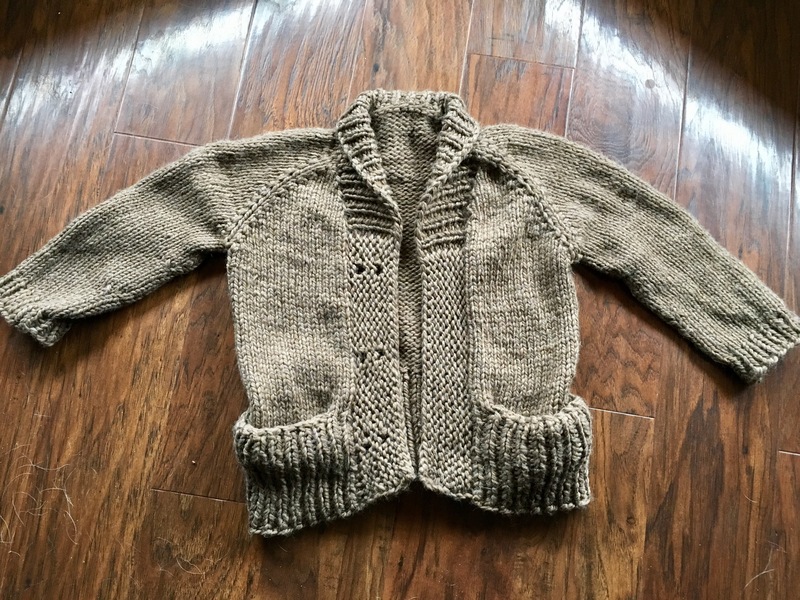 The Storytime Scholar sweater is done! I made it just under the Pigskin Party KAL deadline. It has been washed and ends woven in. 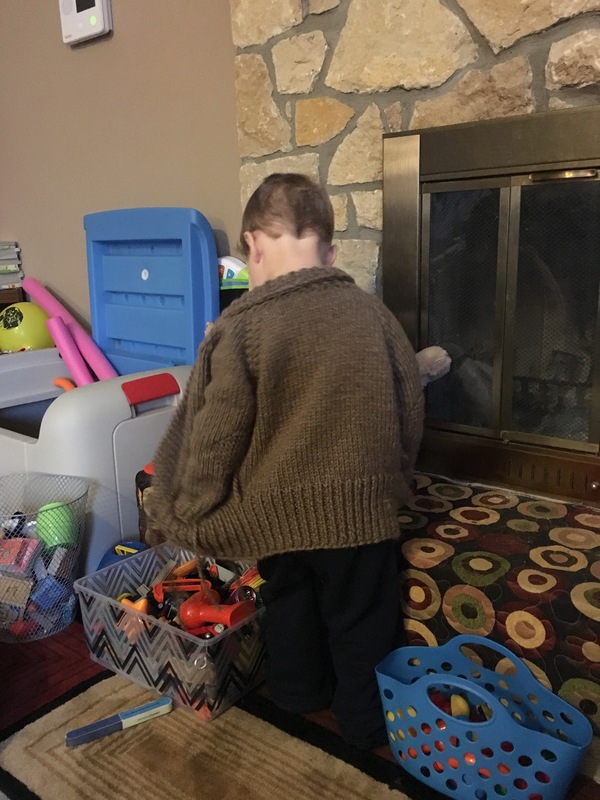 I went to sew on the buttons and I was informed by the tiny terrorist toddler that under no circumstance did it need buttons…. I only got one halfway decent photo of him and it was from behind…before the ends were woven in. But such is life with a toddler! 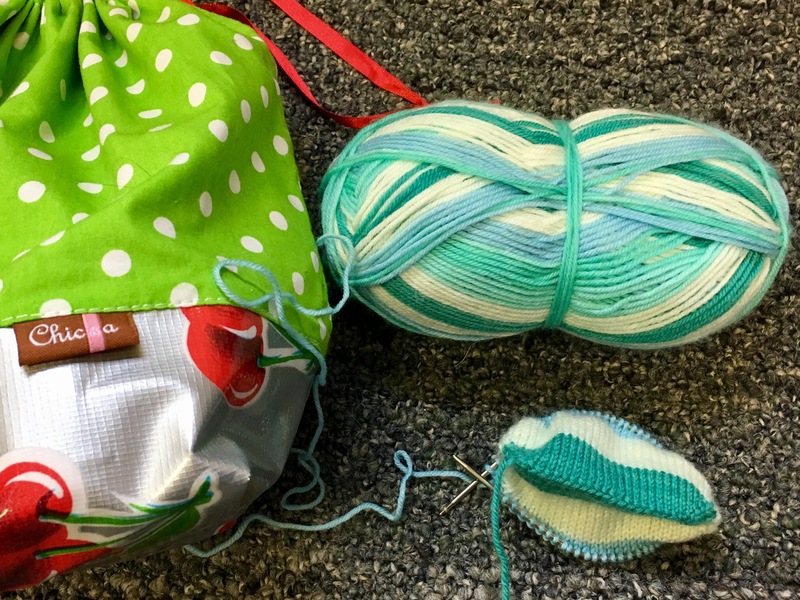 I used approximately 465 grams of yarn or 511 yards. That is just over four and a half skeins of Knit Picks Biggo. I used some rabbit heather colorway from my stash. My newest Camo sock has a heel! 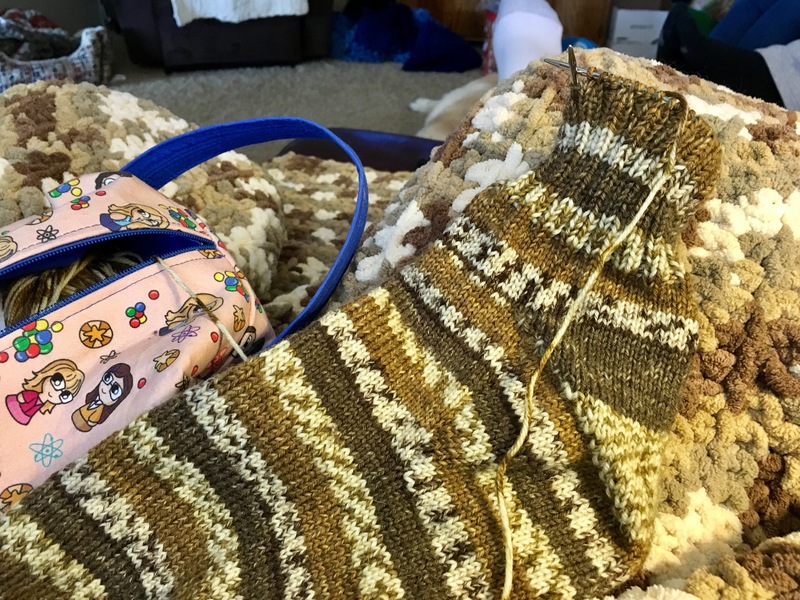 I wasn’t fussy about the striping sequence in the gusset heel. I was in a webinar training for a couple hours this weeks and managed the entire heel turn! I just can’t get over how ginormous this sock is.. I also put a new tool to use during my heel turn! I once again felt the siren’s call of the Sock Yarn Memory blanket. Due to a recent bout of sinus infection and double ear infection I managed to add the entire bottom row while home sick from work. I have amassed a ton of scraps over the past year and I have plenty of “fuel” to keep this going for awhile. I see this project as being heavy in the rotation for awhile! Sometimes I just sit and pet the pretty. Very good for stress relief but not so good for actually making progress, lol.